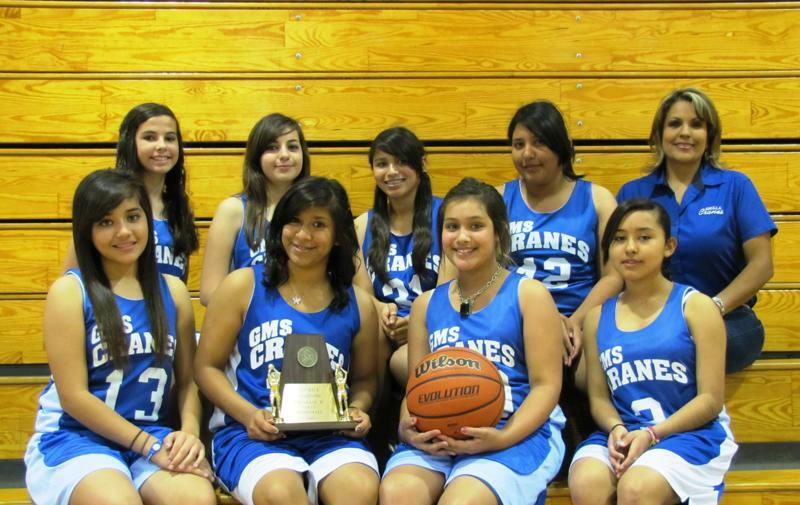 Grulla Middle School congratulates the 7th Grade "B" Girls basketball team on their district title. A job well done and the following team members contributed to this success; Pictured left to right are (Top row): Sarahi Garcia, Yamilex de la Garza, Esmeralda Ramos, Melissa Garcia, Coach Letty Limon. (Bottom Row): Ashley Cardoza, Julie Monsivais, Larissa Rivera, and Mckayla Bernal. Not pictured are Dominique Benavidez and Ashley Cota. A special thanks goes out to Grulla Middle School parents, principal Mr. Serapio Trillayes and Asst. principal Mr. Ariel Ozuna for their support during the entire season. Great job ladies, and keep up the good work!